Practice standards come from assessments that measure progress towards one or more of the Common Core Standards for Mathematical Practice or other 21st Century Learning Skills. 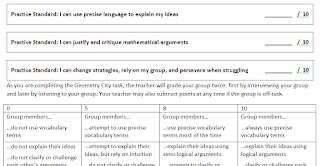 I typically assess these with with collaborative tasks or projects and grade them with a rubric. The tasks I use vary widely between formal performance tasks, group presentations, debates, modeling tasks, games of taboo and pictionary, error analysis, and more. My rubrics also vary. 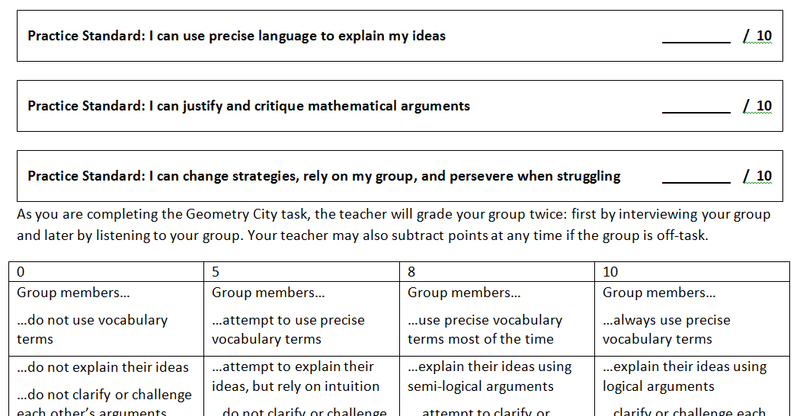 The practice standard rubrics are out of 10 points, like my content standard rubrics, but the rows depend on the specific task students are doing and the skill I am trying to assess. Using similar tasks as bookends on a unit gives students a chance to reflect back and see how the mathematics they learned allowed them to dig deeper into a specific problem.